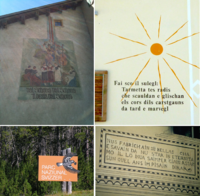 Frae tap left tae bottom richt: Sutsilvan inscription on a hoose in Andeer, Sursilvan hoose inscription in Trun, Rumantsch Grischun sign in the Swiss Naitional Pairk, Vallader Sgraffito in Guarda. 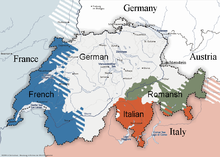 Romansh (an aa spelled Romansch, Rumantsch, or Romanche; Romansh: rumantsch (help·info), rumàntsch, romauntsch (help·info) or romontsch (help·info)) is a Romance leid spoken predominantly in the sootheastren Swiss canton o Grisons (Graubünden), whaur it haes offeecial status alangside German an Italian an is uised as the medium o instruction in schuils in Romansh-speakin auries. ↑ "Population résidante permanente âgée de 15 ans ou plus, selon la langue principale". Office fédéral de la statistique. Retrieved 17 November 2014. ↑ Nordhoff, Sebastian; Hammarström, Harald; Forkel, Robert; Haspelmath, Martin, eds. (2013). "Romansh". Glottolog. Leipzig: Max Planck Institute for Evolutionary Anthropology. This page wis last eeditit on 23 Mey 2018, at 23:14.